Being one of the top wedding reception locations San Diego offers, our glass sided reception pavilion takes the beauty that surrounds you and makes it the backdrop for your reception. A spacious room that will accommodate parties of up to 250 guests with dancing, you will find yourself marveling at the simple elegance that surrounds you. It is no surprise that so many couples walk in and immediately see themselves celebrating their special day surrounded by the magnificent views and beauty. Decorating is a delight when you start with so many breathtaking features. Whether your vision is simple or more elaborate, you will find yourself engrossed in the possibilities, yet amazed with the ease of making your vision a reality. 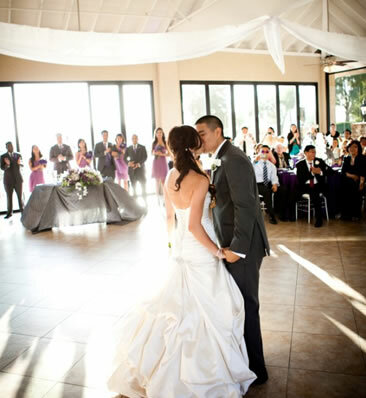 Trust Steele Canyon Golf Club for your premier San Diego wedding reception location. San DIego’s Premier Wedding Reception Venue. If your vision includes dancing under the stars and beautiful sunset photography, the adjacent sunset deck will be the highlight of your evening. Perfect for hosting your cocktail hour with complete bar service, tantalizing appetizer selections and the gentle breeze sweeping over the hillside, you and your guests will enjoy celebrating the occasion all evening long on this most elegant of features. We host several open houses during the year where our wedding parties get hands-on decorating ideas, meet our preferred vendors and sample the menu items from which they will select their reception menu. These amenities make planning easier and provide invaluable assistance. 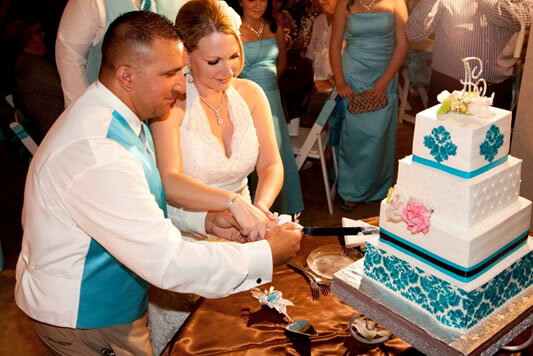 Come in and see why Steele Canyon Golf Club is the canvas on which you will want to paint your wedding memories! Our reputation for best San Diego wedding receptions, quality, service and atmosphere are the benchmark by which we continue to provide our brides, grooms, their families and guests with one unforgettable experience after another.